The top five years for setting record maximums were all during the 1930s. No year this century even shows up in the top fifteen. Last year didn’t even make the top sixty. Now, let’s correct for the absurd worst case TOBS, where every single record high was double counted. 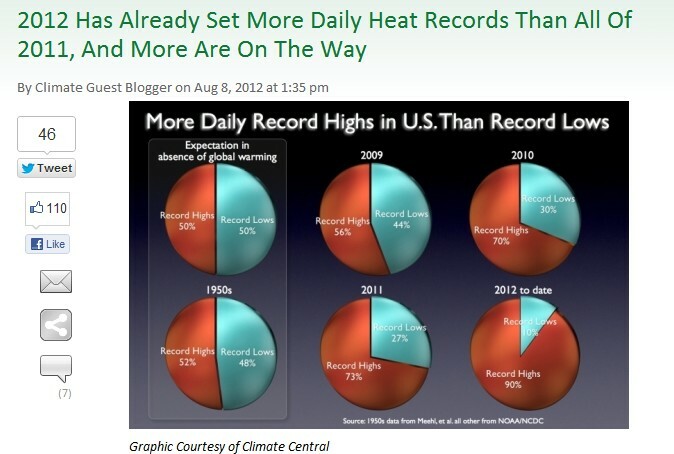 Even if we divide the 1930s numbers by two – they are still hotter than 2011. There is no theoretical argument which can justify the history rewrite being done by the NOAA Ministry of Truth. 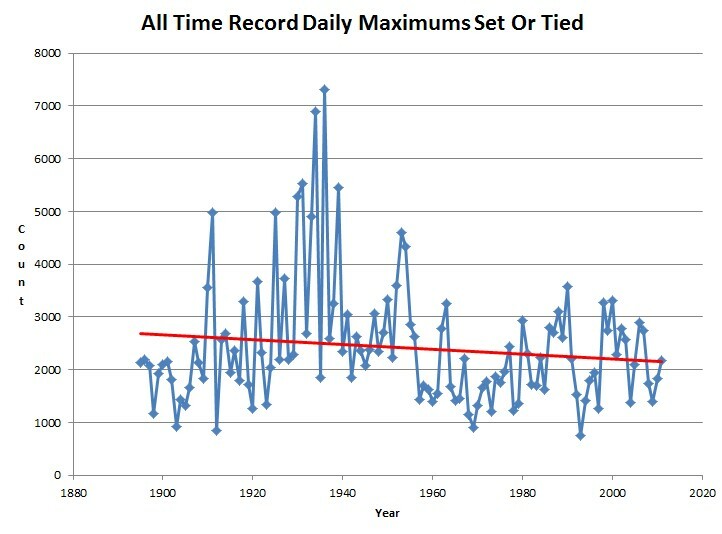 Romm is hysterical about the number of record highs, justified by loading up the statistics with many stations which didn’t exist before the 1960s. 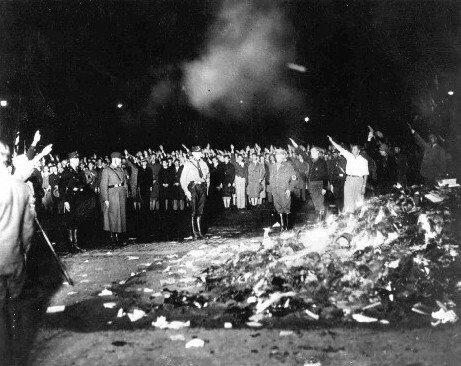 These people have a thousand ways to cheat and lie about our history, which makes them virtual book burners. Now we can use their own network against them. The USCRN , which is the US climate reference network , has been operational for four years now. It is a network of some 124 pristinely sited weather stations with multiple devices for recording temperatures . They are representively distributed throughout the continental US and include ten in Alaska and Hawii . These very accurate stations show that July of 2012 had an average temperature of 75.55 instead of the homogenized , adjusted , and generaly fabricated 77.7 that the warmists are promoting . Why aren’t the warmists using the new reliable measurements from the new network ? Because the reliable data does not support their agw agenda. The warmist motto is if the data doesn’t agree either pretend it doesn’t exist or change it using false adjustments and homogenizations . Seriously, it was hotter in the ’30s then now. It was hotter during the Medeival Warm Period then now. The hockey stick is bogus. There is nothing wrong with the climate. I agree with you but there is one point to be made. The recent announcement is average temperature and not high temp. As we (people with common sense) know UHI has the effect of not letting the night time low temperatures go down the way they would naturally. This “man made structure” warming raises the average temp. So the alarmists can conveniently claim it is warming while purposely avoiding any mention as to the real reason. When you see 121 in North Dakota, 116 in Indiana and 112 in West Virginia, 108 in Duluth, MN, then you can start making comparisons with the 1930’s. Nothing remotely close to any of these the last 2 years. I’m semi-OK with the idea, but of all the issues where Christie shows his RINO stripes (if they have stripes, but they are heavy) it’s global warming er climate change where Christie has aggressively pushed the leftist talking points. Why is the cimate change issue so important to Republicans? Because O has justified his entire war on energy on the trumped up theory. Further, this goes to the core of the leftist dream, the dream of de-industrialization that is fully antagonistic to the conservative spirit. Indeed, the 2009 cap & trade bill that passed the US House, with mandatory 83% CO2 cuts, would have led to the kind radical de-industrialization that conservatives are very much not thrilled about. Also, conservatives now feel outraged that they were duped by the ideologically driven, fear-mongering Chicken Littles. If Christie can’t see the ‘science’ for the baloney that it is, at least, in respect for his own party, he can tone down his too vocal support for the leftists. Maybe Christie can walk that issue back. That would help a lot. The only way the alarmists can gin up a warming signal is by creating it artificially through the manipulation (i.e. interpolation, homogenization and TOB adjustments) of the land-based temperature record. Climate science has been thoroughly politicized in a premeditated attempt to create a non-existent crisis that governments, universities, energy companies, and carbon traders can make a mountain of money from. The charlatans (sorry, scientists) responsible for justifying this global money grab should be hounded from our midst and charged with fraud. Their malevolent (and criminal) actions pose a clear and present danger to all of humanity. In the 1970s, some of the same people, including the New York Times, were absolutely panicked that the world was going into an Ice Age. The people were going to starve because they were going to be frozen over. That seems to be conveniently forgotten. So this claim from you that the 1930s was hotter ……. are you claiming that this was a GLOBAL phenomenon?? The silence is telling. Because the 1930s heat was a US phenomenon only, and even then over only a part of the US. The cherry-picking you guys do is unbelievable. Conclusion: WORLDWIDE, the 1930s were likely hotter than now!